Get off at Hakoneyumoto from Shinjuku by Romance Car. 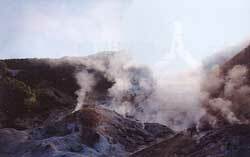 17 separate hot springs are located in the Hanone area with a great deal of atmosphere, good places to see and leisure spots. This hot spring is accessible from Tokyo area by train or car, so a day trip is possible. Outlet Center is located where there are famous brand shops and restaurants stand in a row, from which Mt. Fuji is seen. It takes one hour from Oita Airport to Yubuin-ekimae by bus. Yubuin-cho is called Karuizawa in Kyushu, which is extended at the foot of beautiful Yufudake, where unique art museum and fashionable drug stores are dotting, being favorite with ladies. Moreover Yudaira hot spring has a history of 700 years and while walking the exotic olden stone pavement, people feel as if they slipped back in olden time. The area of the largest bathroom is 240 m2 . The amount of springing out is the top in Japan. This hot spring is famous for Yubatake, the purpose of which is to cool down the water temperature appropriate for customers since the temperature at the time of springing out is too high. The quality is of one of the largest acidity in Japan with strong sterilizing properties, so many customers still visit the hot spring. On the other hand the outside of the town are dotted with fashionable cafes and pensions. [Articraft] Articraft made of glass is exhibited and sold. This glass articraft that is made, imaging the hot spring in Kusatsu is best for the souvenir. It is possible to experience making the glass articraft by blowing air. [Shopping] On the way to Kusatsu by JR Shinkansen (super express train) near Karuizawa station there is large-scale outlet, called Karuizawa Prince Shopping Plaza, with about 200 shops. The most popular hot spring in Hokkaido that is called hot spring paradise. 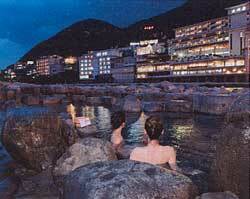 The most attractive thing is the great variety (11 kinds ) of its quality, which is called “department of hot spring ”. It is also attractive to eat fresh seafood that was unloaded at Noboribetsu fishing port. [Bear ranch] 120 of brown charming bears are being bred in the bear ranch. In this area there is “Yukara village” that reproduced the life style of the Ainu race (native who lived in old Japan), where dancing of the Ainu race is shown. This hot spring prides itself on the most amount of springing out in Japan. 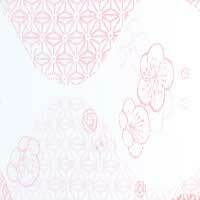 It is also known as Beppu Hattou, which means that there are different kinds of quality of hot water. In the surrounding area there are “Umitamago”, that is an aquarium, African safari etc. Beppu is located near the sea abundant in fish, so people can enjoy delicious fish like mackerel and balloonfish of quality. 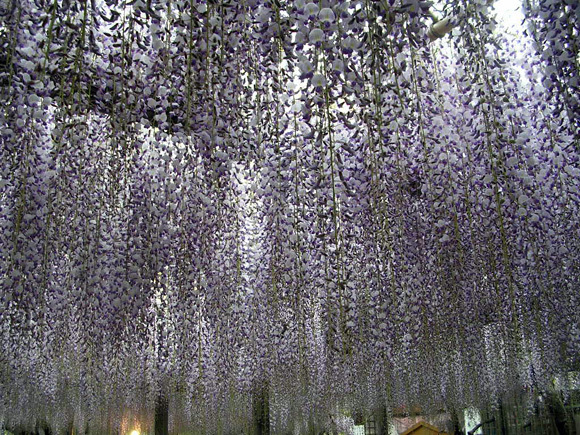 The amount of springing out is plentiful and the sources of hot spring are said to be about 800. Ibusuki is the city where phoenix, hibiscus and coconut trees are growing along the seaside with a great deal of atmosphere of the southern country. 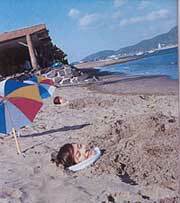 The sand bath in Shugahama in most famous in Japan. It is very comfortable to stay in the sand with fragrance of the seawater under the blue sky. 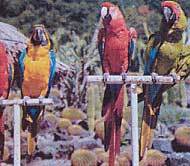 [Zoo and botanical garden] In the zoo and botanical garden located at southernmost tip of the Satsuma peninsula there are 100 kinds of animals in the jungle of 1000 kinds of the subtropical plants. The oldest hot spring in Japan that is described in Nihonshoki (oldest historical document) with a history of more than 3000 years. The symbol of the town is the main building of Dogo hot spring built in 1894, creating the atmosphere of the nostalgic space. It is fun to make tour of foot bath. There were small ryokans (Japanese-style inns) along the ravine of the beautiful river, remaining the atmosphere of hot-spring resort quietly among miscellaneous trees. Quite nostalgic matching the image of the remote hot spring. 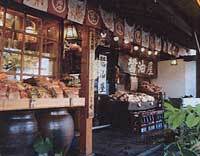 Near the hot spring there is a shop that sells baked cakes made of materials obtained around the Aso Mountains. 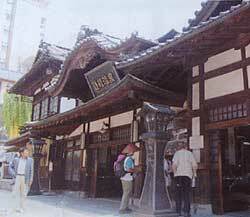 This has been one of three famous hot springs in Japan along with Kusatsu and Arima hot spring since Muromachi Era. Bating slightly in the hot water, the skin will become soft and smooth, thus being called ‘beauty’s hot water’. In the neighborhood there are many picturesque places like Iwao Rikkyo. Famous hot spring with a history of 1400 years, being called the stage of the fiction ‘Kinosaki nite’ written by Naoya Shiga. 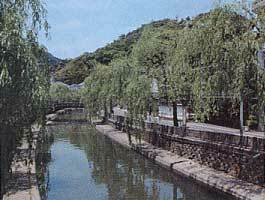 It is located in the poetic town with the arched bridge made of stones across the river, the row of willows etc. In the town there are seven separate hot springs, and it is fun to visit these seven separate wearing Yukata which is Japanese-style unlined cotton kimono.